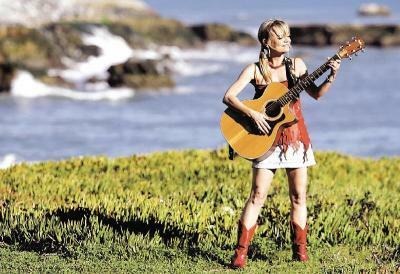 Former UCSC Professor Michelle Chappel is now an award-winning musician. Photo courtesy of Michelle Chappel. Her melodies were hand-delivered to the Dalai Lama, and she plans to send musical mail to President Obama by the end of the year. Two years after being voted “Most Inspirational Psychology Professor” at UC Santa Cruz in 1992, Michelle Chappel reached success overseas. Her self-titled debut album topped music charts, reaching No. 9 in South Africa. After trekking back and forth between music and teaching, in 1995 the beloved professor left UCSC to answer a personal calling and pursue a career as a singer-songwriter. Chappel received her Ph.D. from Princeton University and taught at UCSC after leaving a teaching job at Santa Clara University. When she began teaching at UCSC, Chappel already knew music would ultimately take precedence. Chappel played shows at various venues in Santa Cruz while teaching at UCSC, including the Catalyst Nightclub downtown. Students were very supportive of her music and she even played alongside former psychology major Vincent Charles, who was taking her physiological psychology class at the time. Students frequently came to Chappel’s office hours for life advice, often about where to go to graduate school. Chappel’s lyrics speak of finding hope and persistence in the midst of thorny circumstance. Her song “A Little Act of Kindness” was hand-delivered to the Dalai Lama and recorded on her new album “Shine.” All of the royalties for the song will be donated to efforts to free Tibet from Chinese rule. In 2008, Chappel won a Billboard award in the Americana/Folk category for her song “No Place Like Home.” She plans to turn the award-winning song into a global message of perseverance despite economic struggle. The music video is based on a true story Chappel came across in San Francisco. She met a man making a documentary about a homeless man who overcame all odds and turned his life around, despite his position at the bottom of the economic ladder. Chappel plans to base the plot of the video on the life of the homeless man and send the video as a gift to Obama when it is completed. On May 31, Chappel performed live on KPig radio. She played her song “Screw You Yahoo,” which became a YouTube hit last December, receiving over 17,000 views in one day. The song is a satirical bit that laments the automatic response of many companies to turn to layoffs whenever times are hard. Christian Rorher worked with Chappel when she was a researcher for Yahoo. He has since left the company and now works as the head of a design team for real estate internet sites. Chappel has a feeling her music video message will reach the president, she said, and she hopes it will reach many others as well. Chappel plays at Don Quixote’s International Music Hall tonight (June 4th) at 7:30 p.m. Tickets are $8 in advance and $10 at the door. Photo courtesy of Michelle Chappel.